On a Sunday morning, soon after The Australian first launched what would become a five-year personal vendetta of almost 30,000 words against her, Gillian Triggs got a call from her son living in Paris. Why, he wanted to know, was she trending on Twitter ahead of pop megastar Taylor Swift? Triggs was appointed as president of the Australian Human Rights Commission in 2012, and was previously dean of the Faculty of Law and challis professor of international law at the University of Sydney. The long-running campaign against Triggs flared up regularly during her tenure — especially during Senate estimates, but also in relation to The Australian‘s prolific writings on section 18C of the Racial Discrimination Act. The Australian‘s attack-dog columnists gave Triggs hell. Janet Albrechtsen, over several columns, called her “a laughing stock of taxpayer-funded pomposity and self-indulgence” who has “treated the commission as a plaything for her partisan politics” and “appears drunk on power”. When Liberty Victoria announced Triggs as winner of its Voltaire award, columnist Chris Kenny described it as “an act of evil genius”. When he first met Triggs, shortly after she was appointed Human Rights Commissioner, academic and author Robert Manne asked her whether she knew what The Australian was about to do to her. “She had no idea,” he said. What followed, writes Manne, was an “obsessive, petty, relentless, remorseless and ruthless” campaign against the unsuspecting Triggs. When comparing it to similar campaigns against Indigenous academic Larissa Behrendt and journalism researcher Julie Posetti, he said “neither reached either the level of malevolence or the cultural significance” of the vitriol against Triggs. 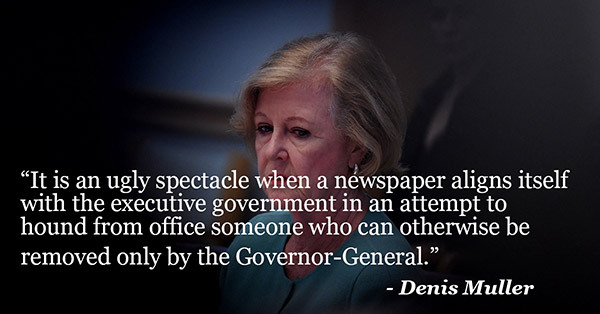 “It is an ugly spectacle when a newspaper aligns itself with the executive government in an attempt to hound from office someone who can otherwise be removed only by the Governor-General,” wrote another academic and former newspaper editor, Denis Muller, in The Conversation. As a media insider, Muller understands the true motives better than most, namely “the advancement of The Australian‘s own self-interest or the settling of personal scores”. As for the victim herself, now in retirement and writing a book about her experiences, she says her main regret was not correcting what she says were inaccuracies early on. “If I had my time again, I’d push back harder from the beginning,” Triggs told Crikey. “But at the time you’re trying to get on with it. You don’t want to create antagonism. And this job is not about being a star in the media.” But, she laments, people concentrated “more on me than the issues” and that became a negative issue in itself.